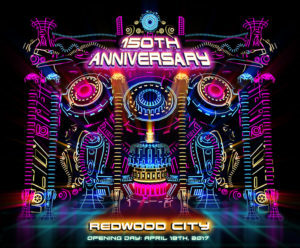 REDWOOD CITY, Calif. (April 6, 2017) – On Tuesday, April 18, the Redwood City Improvement Association, a non-profit community benefit district that works to enhance the Downtown Redwood City experience, will release a new 3-D video mapping light show in honor of Redwood City’s 150th anniversary. The Magic Lantern 3-D Show is designed by world-renowned light show artist, Bart Kresa, and projects weekly onto the San Mateo County History Museum. The new Magic Lantern projection-mapping spectacle brings Redwood City’s past and present into the future. The Magic Lantern 3-D Show will cover the San Mateo County History Museum with an array of colorful lights taking viewers on an abstract adventure through Redwood City’s history. The show, titled RWC 150, depicts a mysterious time-travelling robot, from the days of redwood forests, through the hippie movement, and into the rise of Silicon Valley. ***Shows continue every Tuesday for until November 14. The weekly Magic Lantern 3-D Show 150 Celebration is sponsored by the Redwood City Improvement Association, Facebook, Redwood City-San Mateo County Chamber of Commerce, Fox Theatre and Rosanne Foust & Jim Hartnett. The public can enjoy the show on opening night at 8:30 p.m. There will be one free 20-minute show on Tuesday nights. For more information about the Redwood City Improvement Association, please visit www.visitRWC.org or follow the association on Twitter and Facebook. The Redwood City Improvement Association (RCIA) was created in September 2014 as a non-profit 501(c)(3) corporation. The RCIA is a community benefit district ran by a board consisting of property owners, residents, community members and businesses. The board is responsible for making decisions in the areas of public safety, beautification, economic development, maintenance and promotions that are most beneficial for the community and its residents, while maintaining the culture and rarity of the downtown district. More information can be found by visiting, www.visitRWC.org or following RCIA on Instagram and Twitter and Facebook.